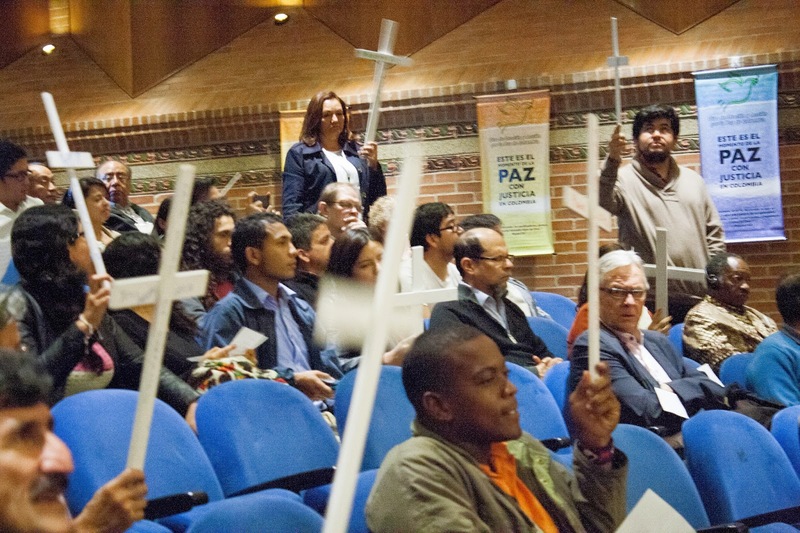 Peacemakers from Colombia, from Latin America, and from all around the world came to Bogota April 8-11 with a common purpose. The Inter-ecclesial Dialogue for Peace in Colombia, (here is a past blog about the group) DIPaz, organized this event to hear from grassroots Colombians involved in initiatives for the construction of peace, to hear from church leaders from other countries who have gone through peace and reconciliation processes, and to hear from representatives from international organizations that have been involved in peace processes. 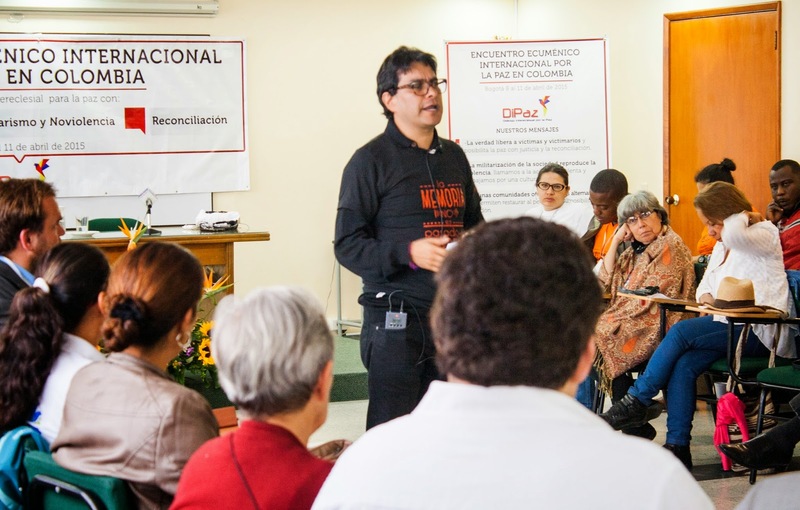 The common purpose or agenda was to create a plan for DIPaz, answering the question: “What should the role of the churches be in the construction of peace in Colombia?” The Conference was titled: The International Ecumenical Encounter for Peace in Colombia. Here is the flyer (in Spanish) advertising the conference. 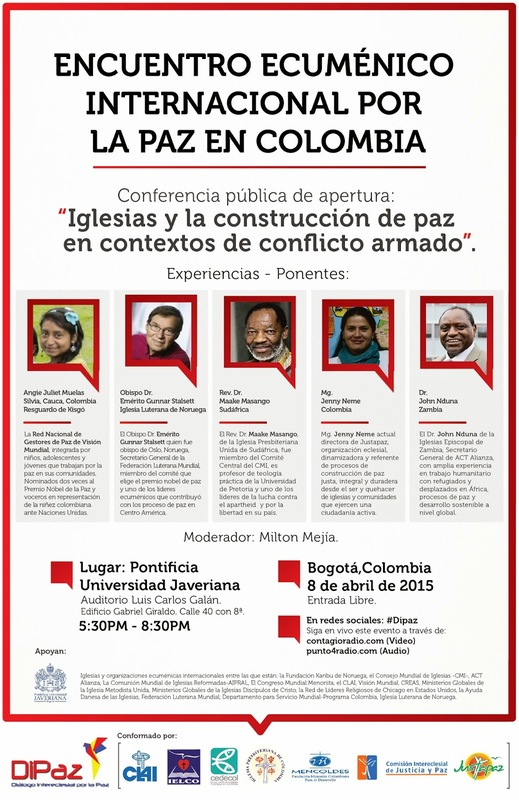 Wednesday, April 8, started with a public event at the University Javeriana with presentations from Bishop Dr. Emeritus Gunnar Stalsett from the Lutheran Church in Norway, the Reverend Doctor Maake Masango from South Africa, John Nduna from Zambia and Secretary-General of ACT Alliance, Jenny Neme Director of a Justapaz (a Colombian peace and reconciliation organization), and Angie Juliet Muelas from the Kisgo Indigenous Reserve in Cauca, Colombia. It was a time of powerful stories and experiences from within and from outside of Colombia regarding peace-building and reconciliation practices, initiatives and challenges. Thursday started with two possible events. The first option was to participate in the national march for peace and to remember the victims of the conflict. 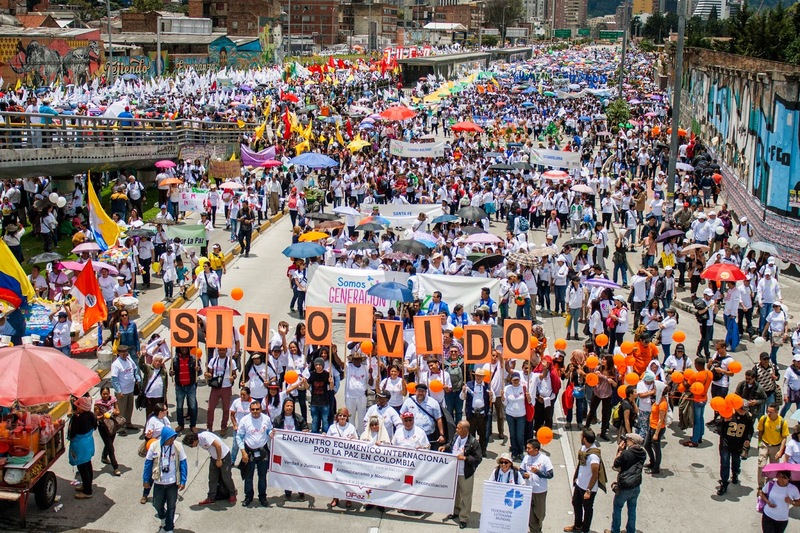 This march happens every April 9, and was attended by tens of thousands of Colombians (and international representatives) in cities all over the country. The second option was to attend a meeting with the Ministry of the Interior presenting DIPaz as an important actor/partner in the construction of peace in the country. I went to the meeting. The remainder of the conference (Thursday afternoon, all day Friday, and Saturday morning) were about working together - from the grassroots representatives to the national representatives and to the international representatives - in discussing how churches have been involved in peace processes in other countries, what worked, what didn't work, and what else could they have done. During the conference, perspectives on the talks between the Colombian government and the guerrillas were shared, along with experiences from civil society members who have participated in the negotiations in Havana, as well as churches and individuals who have contributed to peace processes and reconciliation globally. · We believe that the Fullness of Truth which comes from the Light sets free both victim and perpetrator and makes possible peace founded on justice and reconciliation. · We reject the militarization of our society. We call for non-violent action and we work to build a culture of peace, so that new cycles of violence can be avoided. · We witness to the efforts of those communities which impose new sorts of penalties, so that perpetrators are reintegrated into the community and forgiveness is possible. This is done in the framework of Restorative Justice. 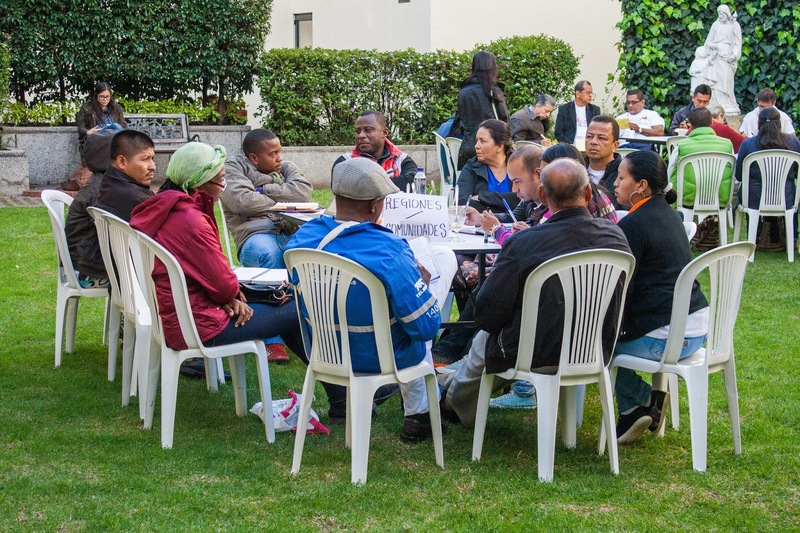 · We note that for any territory to achieve reconciliation there must be just distribution of the land which guarantees dignified work, health, decent housing, rights which belong to human beings and to God’s created order. · We will make available our local churches and the facilities of our organizations as spaces for training, hosting and accompaniment for the work of peace-building and reconciliation. · We offer our churches and organizations as bridges across divides, facilitating difficult and improbable dialogues between opposing factions. · We understand that true peace-building goes beyond the accords signed by the Colombian government and the guerrillas of the FARC and the ELN. · We understand that the fervent yearning of God is for the people to experience a Shalom which transcends the generations, a Shalom that insures that people can have decent living conditions and live in wholeness. · Participation in commissions charged with the humane removal of landmines. · Participation in efforts to achieve a ceasefire. · Involvement in the design and construction of a Campesino (peasant farmer) University. · Involvement in design and development of reception centers in local neighborhoods where combatants who have laid down their arms can be welcomed and reintegrated. · Support for child soldiers (both boys and girls) who leave the insurgency. · Participation in an eventual Truth Commission, and as part of that process. · Bringing to light cases in which members of our churches have been perpetrators of violence. · In addition, bringing to light information about investment of church funds in companies which are implicated in human rights violations in Colombia.